The new trams of Amsterdam are from Siemens and are called Siemens Combino. 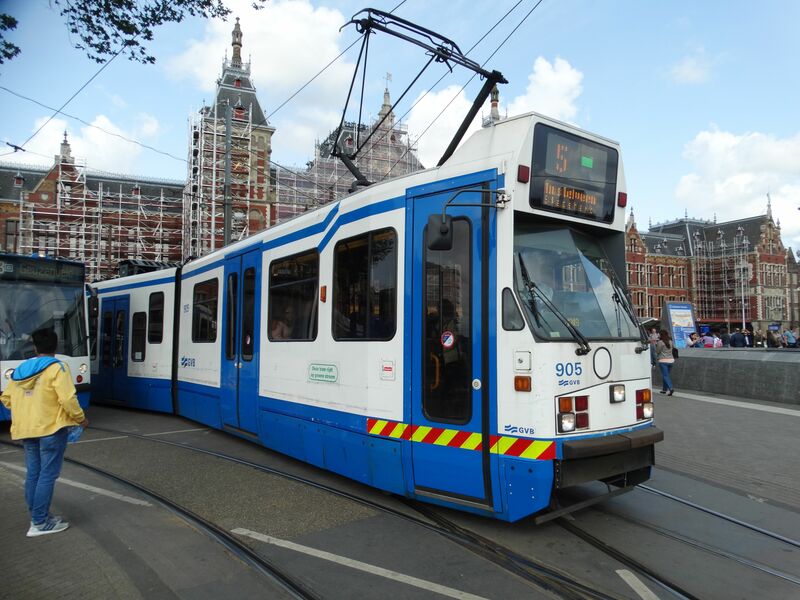 This is Combino no.2010 on route 1 just leaving the tramstop in front of Amsterdam Centraal station. Picture 20.8.2017 by Ilkka Siissalo. 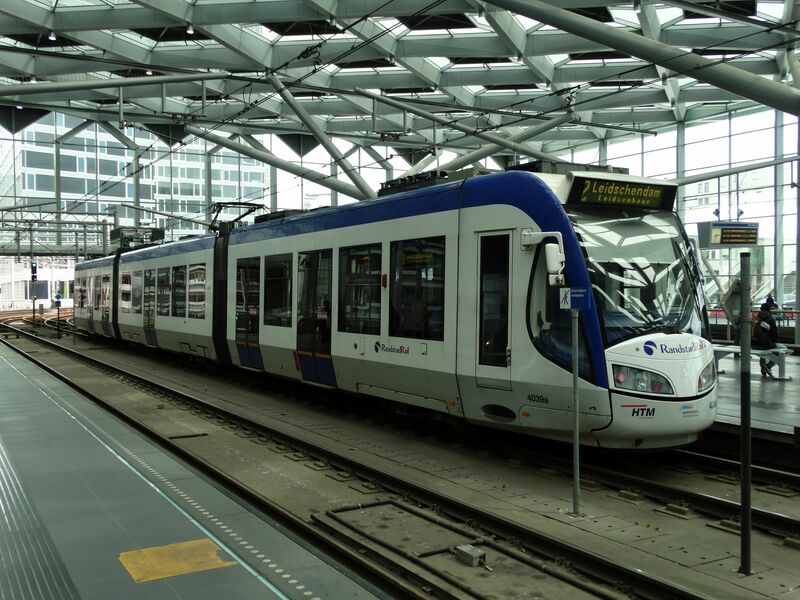 Another Siemens Combino tram just boarding a passenger in front of the Amsterdam Centraal station. Picture 20.8.2017 by Ilkka Siissalo. 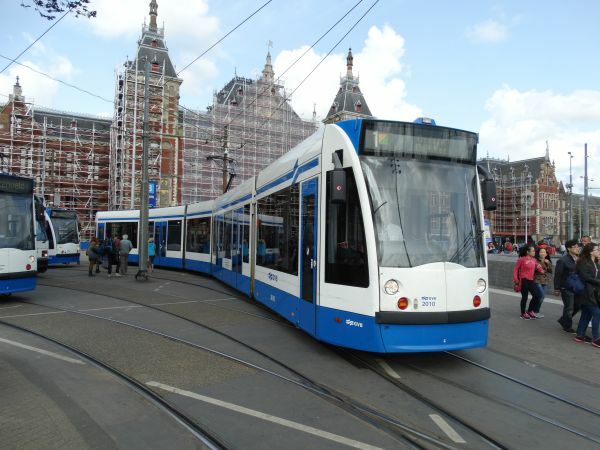 Still another Siemens Combino tram no.2060 in front of the Amsterdam Centraal station. Picture 20.8.2017 by Ilkka Siissalo. Amsterdam tram no. 905 belongs to the tram series called Serie 11G. They have been in use since 1990. They were built by La Brugeoise et Nivelles SA, now Bombardier. There are 20 of these trams, all still in use. They have driver's cabs at both ends and doors on both sides. Picture 20.8.2017 by Amsterdam Centraal station by Ilkka Siissalo. Amsterdam tram no. 835 belongs to the tram class Serie 12G. They also were made by La Brugeoise et Nivelles SA, now Bombardier, since 1991. There are 25 of them and they look quite a lot alike the series 11G, but series 11G trams have two driver's cabs and doors on both sides, whereas class 12G trams have just one driver's cab and doors only on the right hand side. Picture near the Amsterdam Centraal station 10.3.2009 by Ilkka Siissalo. Amsterdam tram no.808 on line 20 at Muntplein. The "Achtasser" trams with two articulated joints were in use in Amsterdam between 1979 and 2015. This old, poor quality picture was taken with a film camera, printed on paper and scanned with a hand scanner in 1999. The photo was taken by Ilkka Siissalo in February 1999. 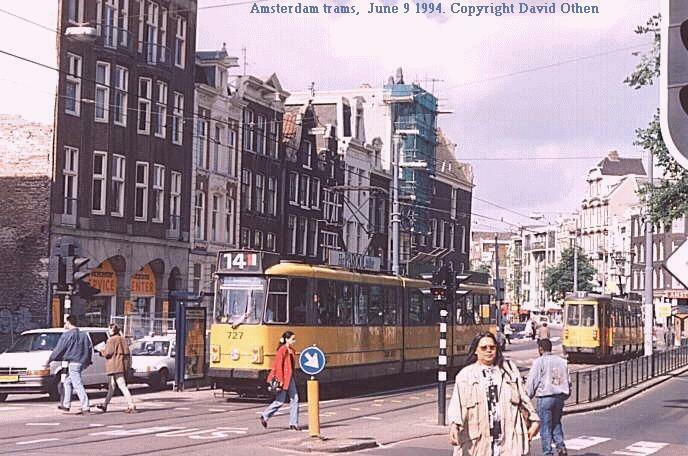 Amsterdam trams used to be yellow in the old days. This picture was taken by David Othen 9th June 1994. 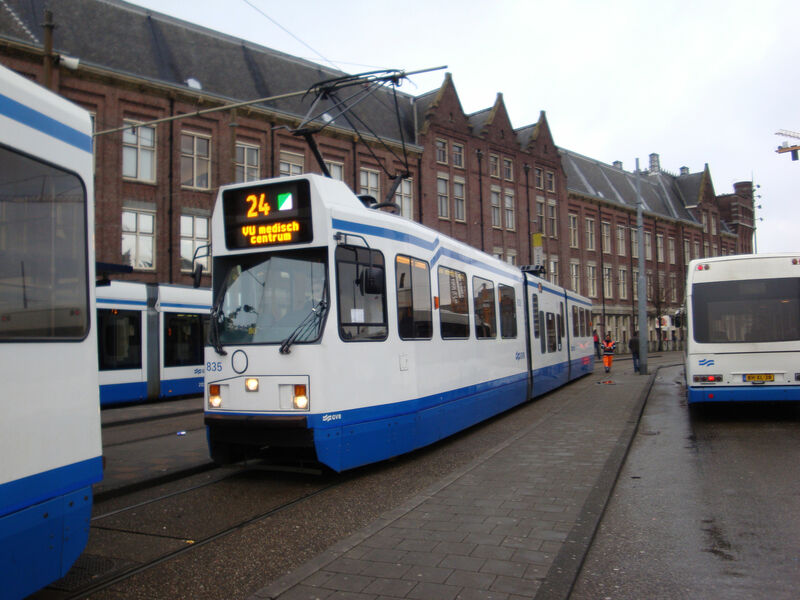 This series of trams 725-779 was used in Amsterdam between 1974 and 2003. 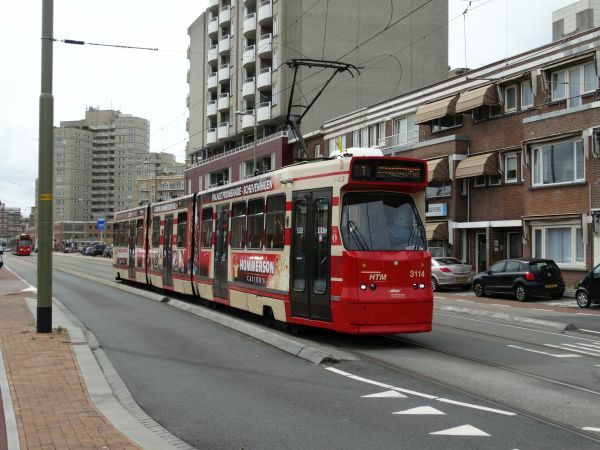 Den Haag's tram of the type GTL8 (Gelede Tram Lang). 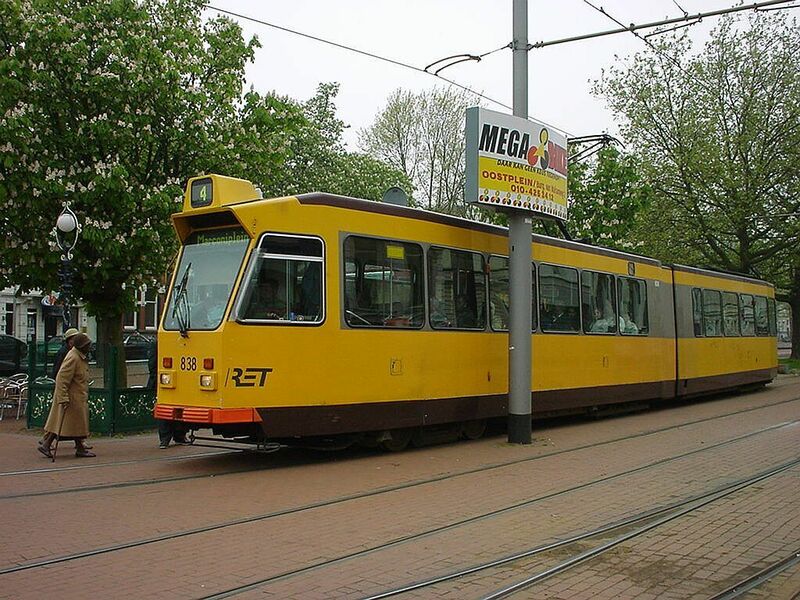 HTM has/had 116 of these trams, which are from the years 1881-84 and as a second series 1992-93. These trams are now being slowly phased out and scrapped while new rolling stock is arriving. Picture from Den Haag Centraal station 18.8.2017 by Ilkka Siissalo. Another one of the old GTL8 trams of Den Haag. Den Haag's new trams are of the type Siemens Avenio. These are now gradually replacing the old GTL8 trams. 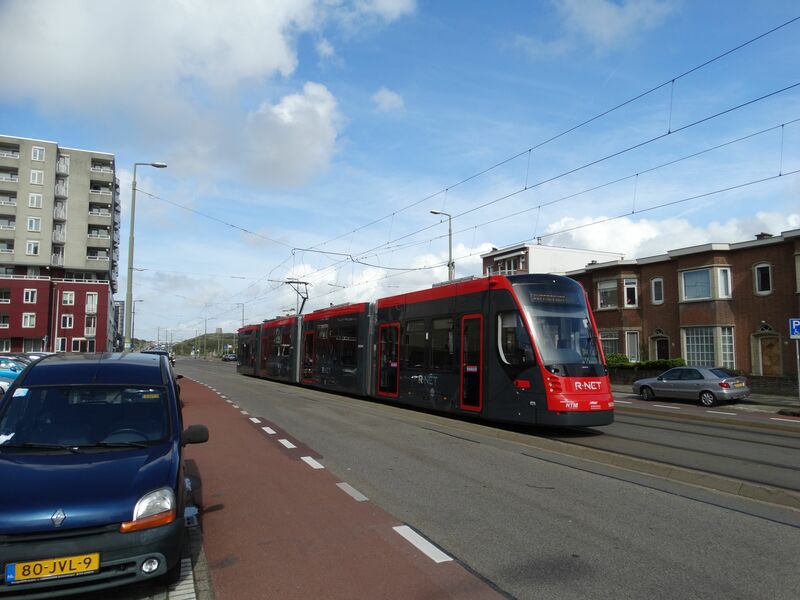 One of the new Siemens Avenio trams in Scheveningen. Picture from Gevers Deynootweg in Scheveningen 18.8.2017 by Ilkka Siissalo. Tourist tram 1193 of Den Haag. 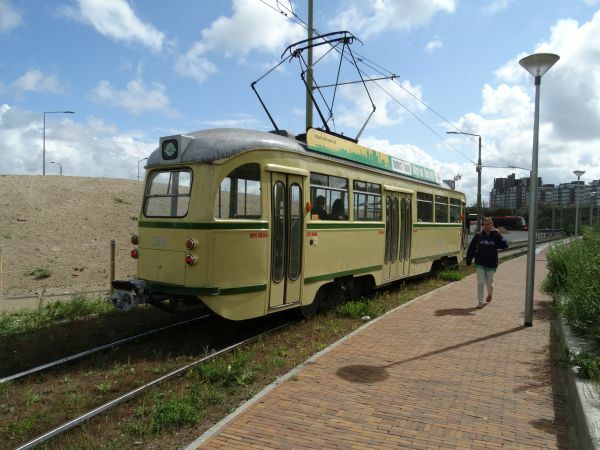 This is a so called PCC tram and it is now owned by Haags Openbaar Vervoer Museum (HOVM). It operates as a touristic sightseeing tram, starting from Kerkplein in Den Haag, then following the tram no.1 route to Scheveningen Noorderstrand seaside and then following the tramlines 11 and 16 routes back to Kerkplein. The tram is a PCC tram. PCC stands for President's Conference Committee. These are American trams dating back to the times right after second world war when most of Europe was in ruins. 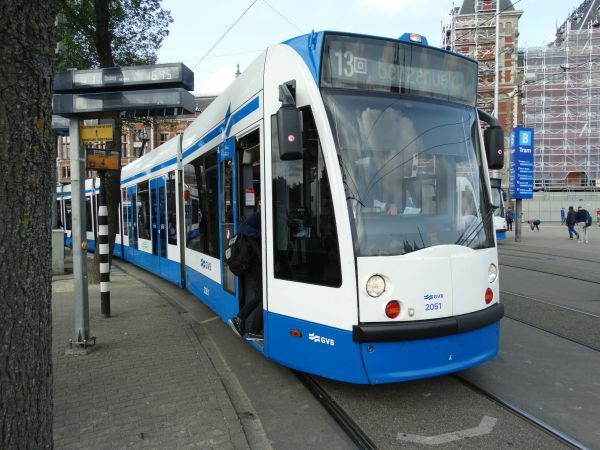 USA tried to help their European allies by the so called Marschall aid program and as a part of this programme also Netherlands received all kinds of help and materials including these trams. Most of the PCC trams were built in Belgium under US licence, but some were built elsewhere as well, for example in Sweden. A part of the trams and their components were sent directly from the US. 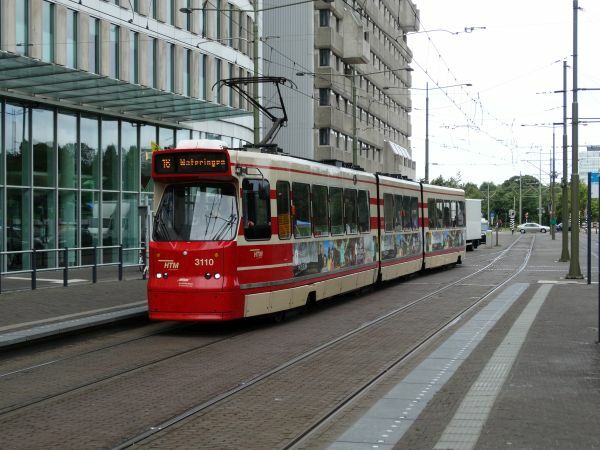 The city of Den Haag received over 230 PCC trams and the last ones were actually made as late as in the 1970s just using the old US licences. This tram is from the third series of PCC trams which dates back to 1957-58. 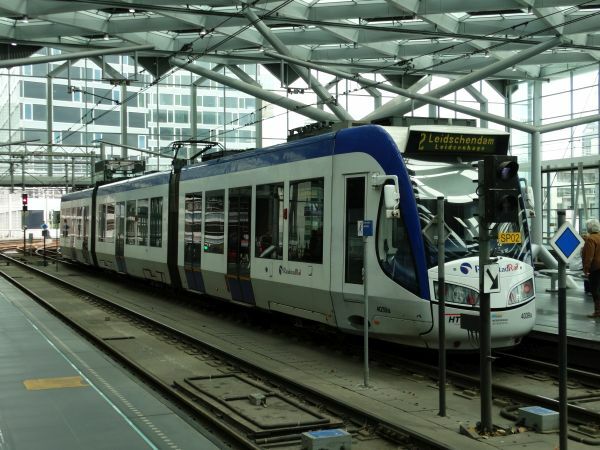 The trams of that series were built in Belgium at La Brugeoise and ACEC. The trams of this series were renovated during 1974-1980 and during that renovation they for example received new and more modern doors. 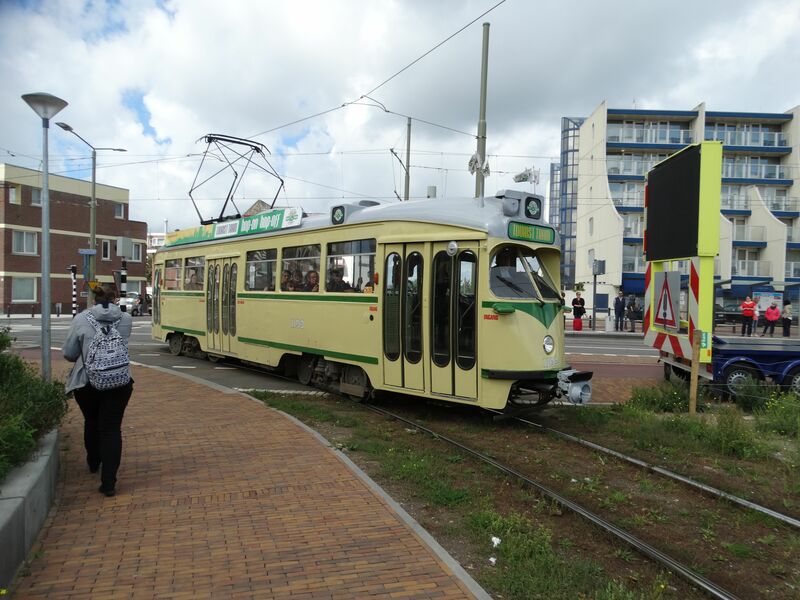 Picture from the tramway loop at Scheveningen Noorderstrand 19.8.2017 by Ilkka Siissalo. The same tourist tram 1193 as above, but now seen from behind. RandstadRail (RR) is the official name of a public transportation rapid transit network in the southern part of Rotterdam, Den Haag Metropolitan Area in the west of the Netherlands, connecting Den Haag (Hague), Zoetermeer and Rotterdam. They operate three tram-train / light rail lines with these RegioCitadis trams. 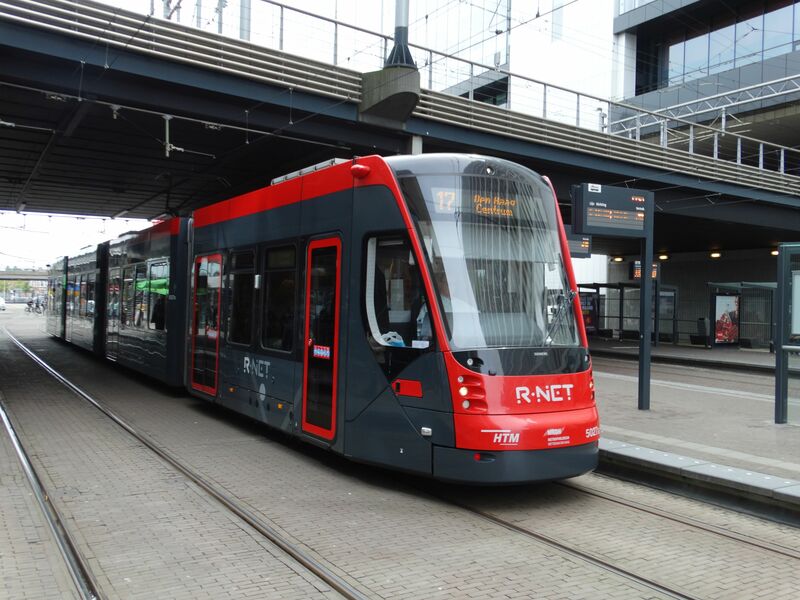 Here one of their RegioCitadis trams is being "loaned" to operate Den Haag HTM's tram line 2 while waiting for HTM's new Avenio trams to arrive. A closer look of the same RR RegioCitadis as above. 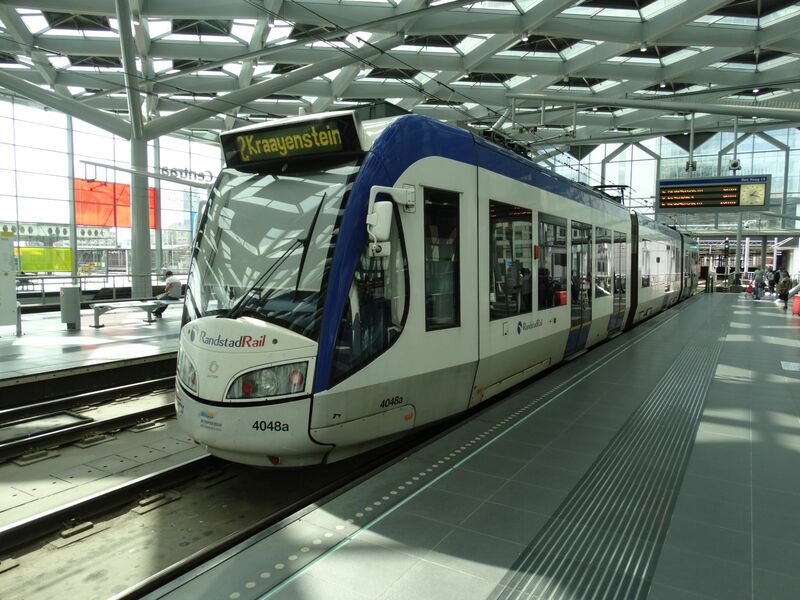 Another one of the Randstadt Rail RegioCitadis trams. They have two driver's cabs and doors on both sides. Picture from Den Haag Centraal station 20.8.2017 by Ilkka Siissalo. 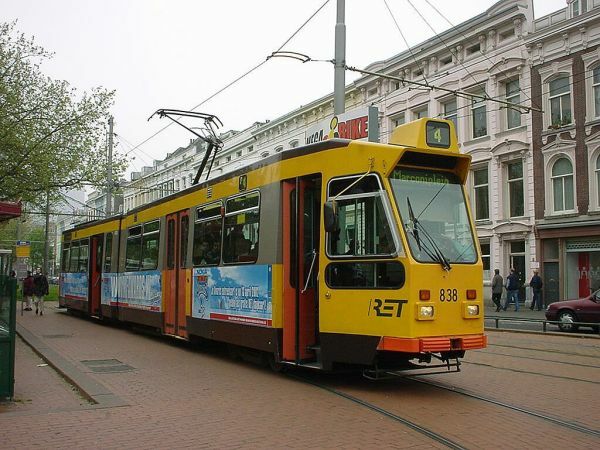 Rotterdam's tram no.838. 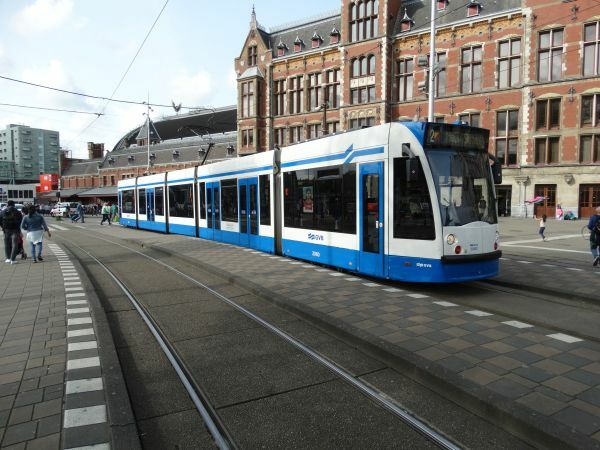 This is a so called ZGT tram (Zwevend Geleed Tramrijtuig). They were built by a consortium of companies Holec, Strömberg, RET, Düwag, RMO and Hainje 1981-88. First ones were taken into use in 1982 and the last ones were taken out of use in 2014. Picture from Spoorweghaven in Rotterdam 10.5.2002 by Ilkka Siissalo. 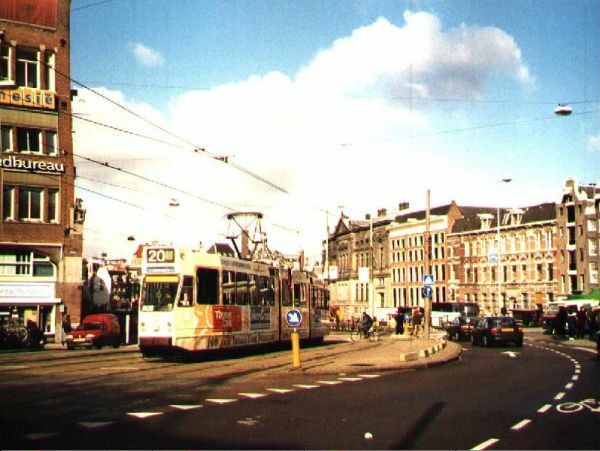 Same tram as in the picture above, but seen from the other side.